* Supports Ripping Audio CD Track using fast and direct method for ripping. * Supports multiple CD-R/RW drives for Ripping. * Play back toolbar for listening to files before converting. * Automatic generation for track names. * Variety range of encoders. Qweas is providing links to Audio Converter Extractor Max 1.0.0.3 as a courtesy, and makes no representations regarding Audio Converter Extractor Max or any other applications or any information related thereto. Any questions, complaints or claims regarding this application Audio Converter Extractor Max 1.0.0.3 must be directed to the appropriate software vendor. 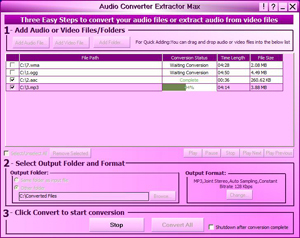 You may click the publisher link of Audio Converter Extractor Max on the top of this page to get more details about the vendor.